INDUSTRY.co.id - Jakarta - In order to welcome the Lebaran season 2018, AXA Financial Indonesia announces the latest collaboration with Shell Indonesia through the program 'Mudik Aman Bersama Shell and AXA Financial Indonesia'. Through this program, Shell customers have the opportunity to gain protection against the risks of personal accident and hospitalization benefits to provide peace and enhance security during the homecoming trip. "Safe Shelter Program with Shell and AXA Financial Indonesia is a form of innovation in improving literacy and opening access to wider financial services.In line with the company's commitment to better empower communities, the program is a concrete manifestation of the company in providing insurance coverage for all Furthermore, this program also affirms the value of the company that is "Customer First" to place customer needs as a priority by offering insurance protection in an easy way ahead of Lebaran, "said Yanti Parapat, Director of AXA Financial Indonesia. Through the program 'Mudik Aman Bersama Shell and AXA Financial Indonesia', AXA Financial Indonesia provides AXA Care Protection accident with benefits in the form of compensation of up to Rp100 million for the incident of death due to accidents and hospitalization due to accident of Rp100 thousand for one time claim that can used for purposes such as buying drugs. The benefits of this insurance will be valid for 1 month starting from June 1 - June 30, 2018, just when the Lebaran season comes home. This protection is in addition to the insurance benefits previously provided to Shell ClubSmart card holders with active membership. Protection from AXA Financial Indonesia can be obtained by purchasing 30 liters of gasoline along with Shell Helix or Shell Advance purchases of at least 1 liter for Shell ClubSmart members in 82 Shell filling stations spread over Jabodetabek and Bandung areas. For non ClubSmart members can purchase Shell Helix ECO lubricant, Helix HX7, HX8, 1 gallon Heli Ultra or Shell Advance Ultra for protection from AXA Financial Indonesia. After making a purchase, the customer will get a unique code that must be activated to get the insurance benefit. The program will run from 15 May 2018 to 15 June 2018 and is valid for 18-64 year old customers. Through this program, AXA Financial Indonesia also provides convenience by utilizing technology to provide a different experience in insurance. Pemudik can directly activate unique code through bit.ly/mudikamanshell website. In addition, the claim process can also use the Whatsapp application to facilitate customers who are in transit. Through a simpler, easier and faster process, it is hoped that more people can be protected in Lebaran 2018 season. Shell Indonesia customers have the opportunity to get AXA Care Protection accident insurance to protect them and their families from the risk of accident during Lebaran season 2018. 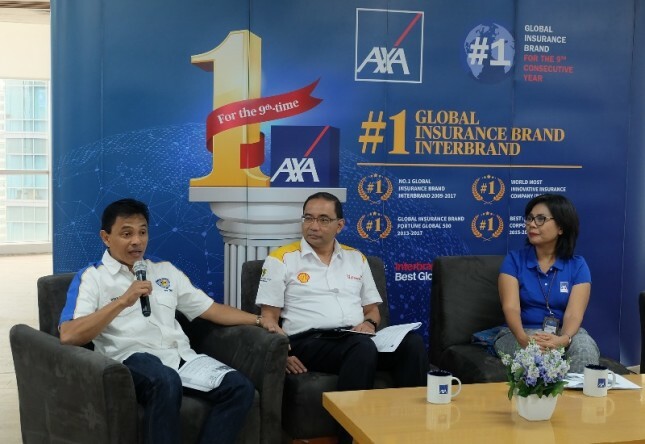 Wahyu Indrawanto, Retail Director of PT Shell Indonesia explains, "Consumers are our main focus, so we do not stop trying to provide additional benefits, one of them through the program 'Mudik Aman Bersama Shell and AXA Financial Indonesia' We highly appreciate the cooperation with AXA Financial Indonesia that has been ongoing since 2015. We are optimistic this cooperation will be well received by our customers. " In line with the culture of going home in Indonesia or going home before the holiday which always has a significant increase in the number of motor vehicles every year, AXA Financial Indonesia and Shell Indonesia also provide information on the importance of ensuring safety in driving (safety riding). "Preparing well before the Lebaran trip has become a necessity, some things that can be done include ensuring a healthy and strong physical condition, resting every 2 hours riding, checking the condition of the vehicle including tires, oil and spark plugs, and not kebut-kebutan on the road "The risk of traffic accidents is unavoidable, so it is important for people to understand how to drive safely in order not to harm themselves and others," explained Dyan Dilato, Indonesian Motorcycle Association and Federation International Motocycle. For more information on this program, customers may visit the website www.shell.co.id or via Shell ClubSmart Customer Service at 0804-1801-050 and AXA Financial Indonesia hotline at (021) 3005 6800 on Monday - Friday at 08.00 - 20:00 pm and Saturday at 08.00 - 12.00 WIB.